- T-Mobile debuts first Google Android phone, thereby changing face of mobile forever, etc., etc. - Wieden and Starbucks break up. - Wrigley sells advergaming goldmine Candystand to Funtank. No word on why the service, which CEO James Baker of Funtank called "great viral marketing," was sold. Maybe it was just time to cash in. - Biggie Smalls hits the big screen. "Too bad we're not in middle school anymore," says a twenty-something colleague. "I'm imagining the tears ... and the hugging." - For the Oct 3 network debut of Star Wars: The Clone Wars -- which objectively sucked -- Cartoon Network is sponsoring 2000 Star Wars-themed house parties across the nation. See creepy fan masks. They remind me of those Arthur plates, but eating off them is probably against some emotionally-enforced intergalactic law. - Wild idea for all the bottled water companies with eco-friendly mantras: paper carton water containers. 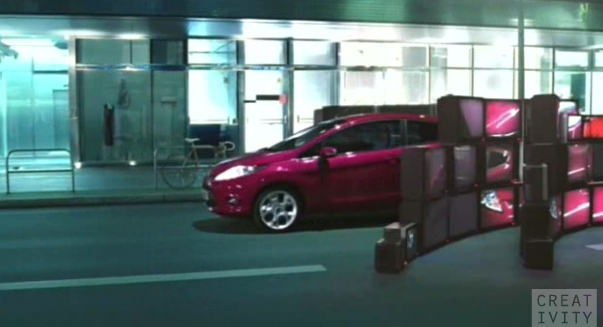 - Flatscreens for the Ford Fiesta? Fun spelling word -- "zeitgeist" -- thrown in for good measure. - Our Future tackles Wall Street insanity with propagandistic print ad campaign. - Oh look, agencies like minorities after all. Agencies that signed a memo of understanding to boost diversity have either met or exceeded their goals since 2006. T-Mobile = 1 Gbps Max Monthly = Android Phone Failure. It's a pity.